January through March is mating season for skunks. 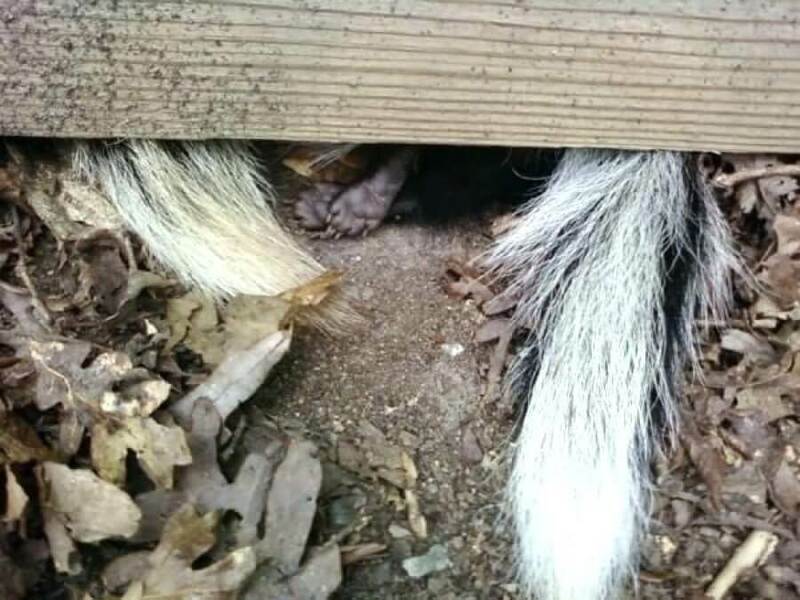 After mating, female skunks will burrow under porches or take up residence in a garage, crawl space or basement for shelter and for a place to have their young. Skunks have been known to ruin air conditioning ducts, drywall, insulation, and other fixtures of your home while burrowing for food and shelter. They are avid diggers and can dig up pipes or underground sprinklers in a yard. Most skunks have white stripes running down their back and black fur on the rest of their body. However, some skunks are brown or ginger colored. It is the size of a house cat and has short legs with large feet and well-developed claws. 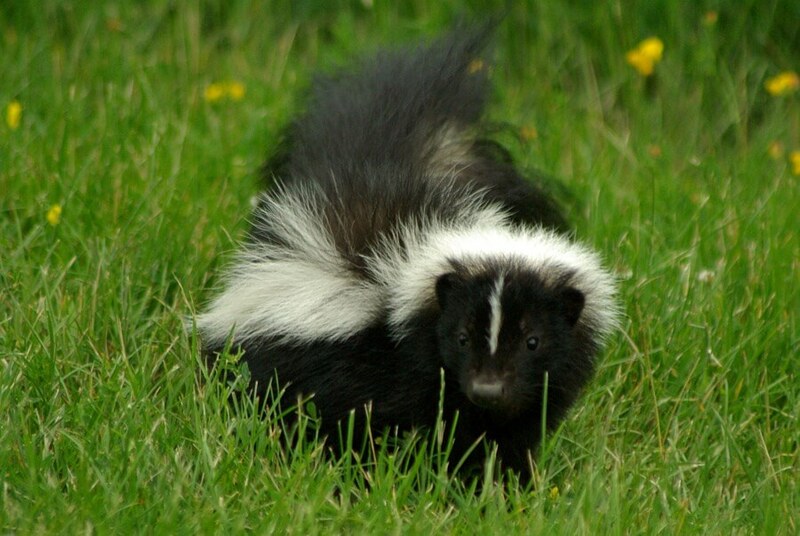 Often, the best way to identify a skunk is by their odor. Skunks are famous for their skunk spray, which has made them creatures feared by nearly all animals, including man. Skunks can be startled easily, and if they spray anywhere in your attic, yard, basement, or other areas of your house or business, it can and will take over the entire home or building, leaving you with a noxious smell that is hard to eradicate. A skunk can shoot a spray as far as 15 feet. The foul-smelling spray that a skunk releases is a golden-yellow liquid consisting of sulfide mercaptan, which can be deadly and cause blindness. The spray can cause pets or children to foam at the mouth and secrete mucus from eyes and can harm their lungs, eyes, nose, and other organs. Skunks will bite if you try to grab or handle them. They are common carriers of rabies and other diseases such as Distemper, Leptospirosis, Zoonoses, Canine Hepatitis, and Intestinal Roundworms. Skunks will leave their feces, urine and spray in whatever area they occupy, which can attract other skunks or animals. The smell and bacteria create health and safety issues. Many people try to get rid of skunks by spreading a liquid or granular skunk repellent around their property or using an electronic motion activated sprinkler that sprays a burst of water at the animal when they are detected. While these may repel a skunk for a time, the skunk will continue to return to your property as long as they believe there is a food source or shelter available. The most effective method of getting rid of a skunk is to bait and trap them, extract the skunk from the premises, and relocate them to a more suitable environment. That is where the experts at Precision Wildlife Removal and Control come in. After the skunk has been removed, we will assess the areas that that need to be sealed off to prevent skunks from getting in again. Some repair and restoration of damaged areas may need to be done. It is unwise to try to trap a skunk by yourself. You are more likely to be sprayed or bitten than to catch the animal successfully. Safe trapping and removal of skunks are best left to the professionals at Precision Wildlife Removal and Control. If you are seeking a wildlife removal and control solution in a residential or commercial building in Michigan or Toledo, Ohio, and the surrounding areas, look no further. Our experienced wildlife specialists will provide a home inspection and if a skunk or other animal is detected, we will humanely trap and remove them. We will clean up the area so it is safe for you and your family. 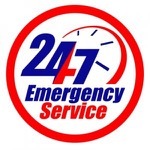 Should you be woken up by things that go bump in the night, don’t stress it, we are available 24/7 for all of your wildlife removal needs. We can ELIMINATE your Skunk Problems!